Jewels Of The Ancients Video Slot Machine - Casino Answers! Jewels of the Ancients is a 5-reel, 19-line video slot developed by Slotland Entertainment, featuring a bonus game and a progressive jackpot. You can play the Jewels of the Ancients at Slotland Casino. The Jewels of the Ancients slot machine is a quarter slot game. 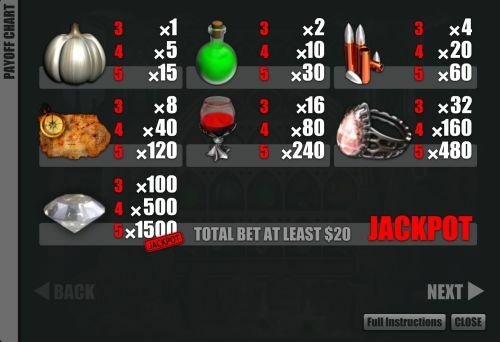 Bets on the Jewels of the Ancients are $0.25, $0.50, $1, $2 and $4 per line. You can select from 1 up to 19 paylines on a spin. The maximum total bet you can make on Jewels of the Ancients is $76 per spin. Being that a single line spin will cost you a quarter, Jewels of the Ancients is not the best slot for the casual player, but will do most high rollers just fine. To play the Jewels of the Ancients online slot machine, select your bet and press the dragon to spin the reels. Jewels of the Ancients is linked to the Slotland casino-wide progressive jackpot. At press time, Slotland’s progressive jackpot was at $61,829. To win the Slotland Jackpot on Jewels of the Ancients, you must bet $20 or more on a spin and land 5 Diamond symbols on a selected payline. If you are betting less than $20, you will instead be awarded the 1500 coin top fixed jackpot. You can win this progressive jackpot by playing Jewels of the Ancients at Slotland Casino! If you hit three Scattered Moon symbols anywhere on the reels of Jewels of the Ancients, you will trigger the Puzzle Bonus game. The symbols will be replaced by a grid of 15 fields. Your goal is to reveal as many different bonus symbols as possible in 6 tries. There will be hints to help you along in the bonus game. If you reveal at least 3 different symbols, you can win $50. If you find 4 different symbols, you will win $100. For finding 5 different symbols, your prize will be $500. Finally, if you reveal 6 different symbols, you will win the top prize of $1000! For those looking for a moody gothic-type vampire slot, Jewels of the Ancients will make for a great choice. You can play Jewels of the Ancients and try to win the Slotland Progressive Jackpot when you sign up today at Slotland Casino! Can players from the USA play the Jewels of the Ancients video slot for real money? Yes, American players are welcome to play the Jewels of the Ancients slot game for real money at Slotland Casino. Can I play Jewels of the Ancients for free? No, there is currently no practice play mode available on the Jewels of the Ancients fruit machine. Do I need to download any casino software to play Jewels of the Ancients? No, there is no casino software required (or available) to play the Jewels of the Ancients slot machine. If you experience any difficulties with the Flash casino, we recommend downloading the latest update for Adobe Flash Player. 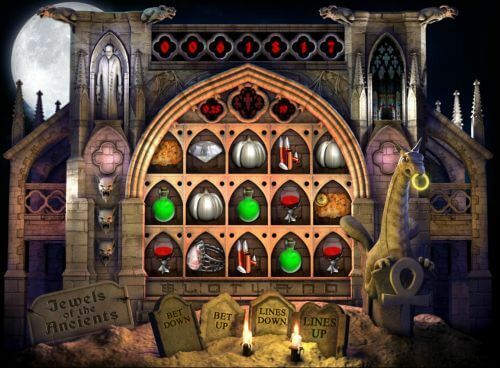 If you want more Halloween video slot reviews, we would suggest you read our list of Halloween slot reviews. The list is full of all kinds of slot reviews to sink your fangs into!